"What is Purgatory?" The Greek word for fire is “pur,” the root word of “PUR-gatory” (see the Catholic Catechism, 1030-1032). Purgatory is a spiritual state that most souls go through before entering Heaven. Purgatory is not a second chance, but is a temporary state that exists for our purification. Sin is a spiritual disease that attacks us from within. We need not only be forgiven, but also healed from the effects of sin. Imagine you said or did something that really hurt a close friend or family member. Most likely, you would want to do something to repair the relationship. In the same way, Purgatory is the opportunity for us to make reparation to God for the sins we failed to make reparation for on earth. Just as we would be appalled to attend a grand banquet in our dirty work clothes, so a soul's thought of entering the Presence of the Holy God in a state of uncleanness will appall him or her. Thus, God mercifully promises “to cleanse us from all unrighteousness” (1 John 1:9). The teaching on the pains of Purgatory consists of two things: 1) pains of loss and 2) pains of sense. The pain of loss suffered by the souls in Purgatory is the greatest pain we will experience; it is the pain of being temporarily separated from the One we love—of being excluded from the beatific vision. St. Thomas Aquinas said, "For the more a thing is desired, the more painful is its absence." The pain of sense suffered by the souls in Purgatory involves the pain of purification. The nature of this cleansing has traditionally been assumed to mean a literal fire, but the only proposition the Church has dogmatically defined on this issue is that the purification involves some kind of pain. However, the Catechism teaches that the fires of Hell and Purgatory are not “vengeance inflicted by God, but follows from the very nature of sin” (CCC 1472). In Spe Salvi, Pope Benedict quotes St. Paul, “Now if anyone builds on the foundation with gold, silver, precious stones, wood, hay, or straw, his work will become manifest; for the Day will disclose it, because it will be revealed with fire, and the fire will test what sort of work each one has done. If any man’s work is burned up, he will suffer loss, though he himself will be saved, but only as through fire” (1 Cor 3:12-15). 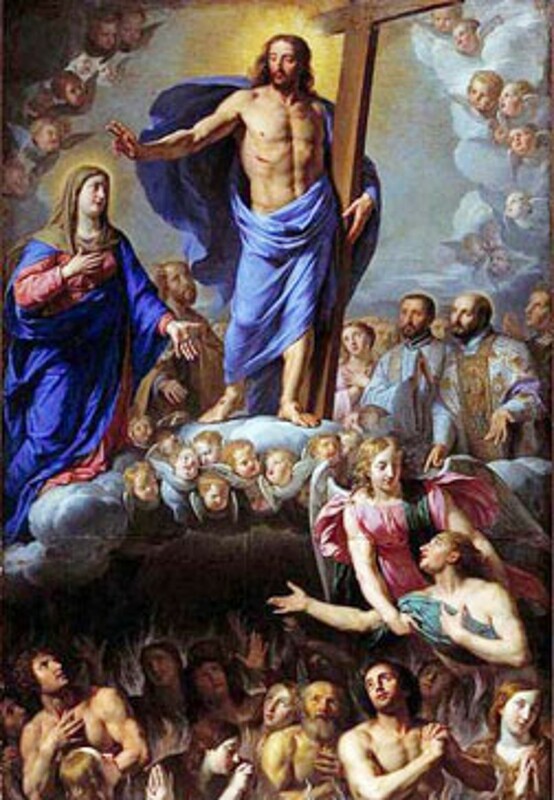 In the Church’s catechetical tradition, this passage is traditionally used to show the Scriptural basis for the doctrine of Purgatory. The image of fire and burning may explain the common confusion of the "fire" of Purgatory with the "fire" of Hell. Lest there be any such confusion, the Catechism tells us that “this final purification of the elect…is entirely different from the punishment of the damned” (§1031). Primarily, the difference is that all who enter into the “purging fire” of Purgatory have the hope of absolute assurance that they will enter the presence of God and attain the Beatific Vision of God’s face. On the other hand, there is a total absence of hope in Hell--it is pure despair. It is obvious that as we are finally separated from all our unloving attachments and stripped of our false self, we will experience pain and suffering. But this is not a cause for fear! “Yet in the pain of this encounter,” writes the Holy Father, “when the impurity and sickness of our lives become evident to us, there lies salvation. His gaze, the touch of His heart heals us through an undeniably painful transformation ‘as through fire’. But it is a blessed pain, in which the holy power of His love sears through us like a flame, enabling us to become totally ourselves and thus totally of God.” Described like this, we see not only how necessary Purgatory is, but also how desirable it is. Far from being afraid of Purgatory, we should begin to hope for it. Objectors to the existence of Purgatory claim that “Christ’s suffering is all sufficient; therefore, there is no Purgatory.” Christ suffering IS all sufficient; however, their claim actually makes too little of Christ’s suffering by failing to recognize all that His suffering accomplishes. God does wash away all our guilt through the Sacraments, but He desires to accomplish even more than that. Christ’s suffering makes Purgatory possible. A world without a Purgatory actually would make God and His sufferings less effective than what they are. People who die in a state of grace often have not had all their earthly desires purified on earth. Therefore, in the true and Catholic understanding, we need to be purged of those desires and sins before we can enter Heaven. We NEED Purgatory! Purgatory was made possible by the grace that Jesus won for us on the Cross. It is the state of existence where we are purged of our sinful desires and are reconciled with God in Heaven and His holy ways. No one in Heaven disagrees with God about what is good or evil, or holy or sinful, or true or heretical. So, before entering Heaven, we need to be purified of all that is wrong. “But nothing unclean shall enter it, nor anyone who practices abomination or falsehood, but only those who are written in the Lamb’s Book of Life” (Rev. 21:27).